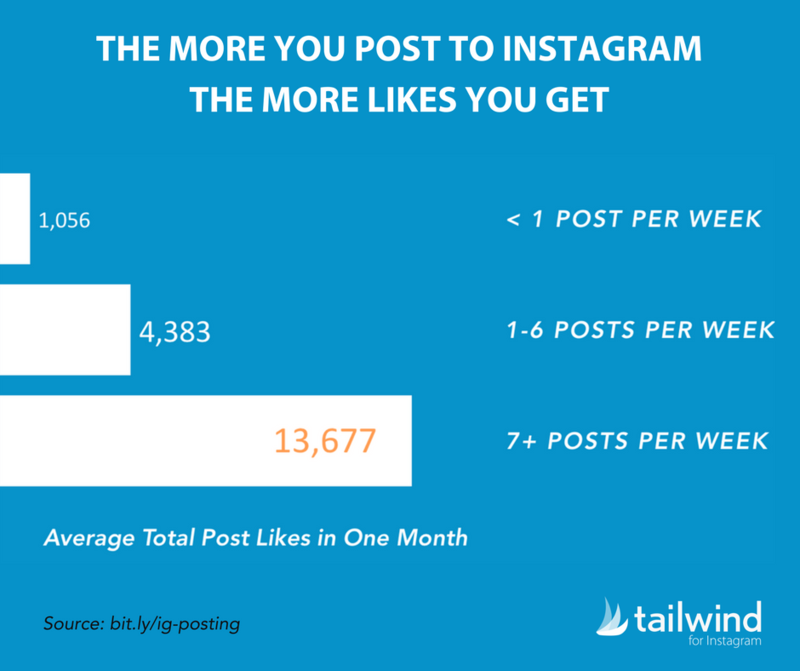 For this original study by Tailwind we took over 100,000 Instagram posts from a three month period and analyzed them to uncover how successful different accounts were when they changed the number of times they post to Instagram each day. We wanted to know how likes growth, follower growth, and engagement rate all change with different posting frequencies. We thought we’d see higher engagement rates (likes plus comments divided by followers) among accounts that post less often. What we found surprised us. There was a significant difference in engagement rates between those who post once per week and those who post seven times per week or more. In fact, we found that accounts that increased their rate of posting over the three month study saw a significant increase in their engagement rate, and enjoyed higher follower growth rates too! If we stop to think about it, it makes sense to me that Instagram would want to reward people for using their platform more. Or at least, not incentivize their using it less. Let’s say you get 1,000 likes per month with your current posting schedule of every other day. It stands to reason that you should get around 2,000 likes per month if you started posting every single day. One of the reasons people give for not increasing their posting volume is a fear that if they post more often the number of likes and comments they get per post will go down, that they’ll be working harder and experiencing diminishing returns. That’s not what we observed, as the next chart shows. Other studies have suggested that engagement rates fall on Instagram when you post more often. This study also found that accounts that post more than once per day have slightly lower engagement rates (7%) than accounts that post less than once per week (8%). BUT accounts that post frequently are also significantly more likely to be large accounts, and large accounts almost always have lower engagement rates than small accounts anyway (because large accounts tend to have a lot more lurkers, people who follow, but don’t engage with their posts). If we look at the data like this we’re comparing apples with oranges. For this reason, in this study we looked at the same accounts over time as they increased their posting frequency. And, as you can see from the chart above, we discovered the exact opposite of what is commonly believed to be true. As individual accounts increase their posting frequency, their engagement rates actually go up, not down. What’s more, the more these accounts posted, the more their engagement rates climbed. For the study we segmented the accounts by size, putting them into buckets of 10K or less followers, 10-100K and 100K+. Whilst there were differences in how likes, engagement rates and followers grew with different posting frequencies depending on size, the differences weren’t all that great and the overall picture was the same regardless of the account size, so for simplicities sake we aggregated those numbers back together for this post. Regardless of your account size, the spirit of these findings holds true. One thing that often gets lost in the conversation about “How often should I post to Instagram?” Is that getting more of your content in front of people and getting more likes isn’t the only advantage to posting more. Our data shows that accounts that post more grow faster too. Significantly faster. Considering how much faster accounts that post every day grow their likes, engagement rate, and followers, the big surprise is that only 5% of accounts actually do post at least once per day. Many marketers try Instagram by posting infrequently. The data in this study suggests that these marketers won’t see the follower growth or engagement on Instagram that they would if they committed to posting every single day. If you’re going to try Instagram as a marketing channel, or if you’re seeing some traction with your Instagram marketing already, you should absolutely commit to posting every day. The challenge to marketers is that coming up with ideas for daily posting is tough! Successful Instagram posts need to be both beautiful and engaging, but often the hardest part is just knowing what to post. With that in mind, we created a 30-day jumpstart program to help you get in the habit of daily posting. Sign up now or learn more. By increasing our Instagram post frequency and using Tailwind for Instagram’s Smart Schedule to post at the best possible times for engagement we were able to triple the Instagram likes our own account in just three months. The easiest way to set a goal of a post a day is with an Instagram scheduler (Here’s a roundup of Instagram Scheduling Tools) that creates a slot every day for you to fill. Tailwind for Instagram comes with all kinds of clever tools and efficiencies, like a browser extension that allows you to regram posts from around the web to your queue in seconds, a 9 Grid View so you can keep your profile page looking beautifully curated, and the ability to find the best hashtags, save lists of hashtags and add them to your posts with just one click. Tailwind for Instagram will auto post video and photos for you, or you can decided to use notifications for photo posts. We recorded time trials and discovered that the average marketer could save hours every year in workflow efficiencies alone!